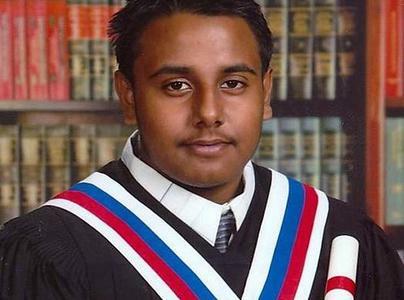 The above photo is of 14 year old Rajiv Dharamdial, known as Ravi, who was stabbed to death last week while walking home from school in Brampton (which is pretty much a part of Toronto, for those of you reading this from outside Canada). Rajiv was sort of a distant cousin of mine, though not a blood relative; at least not to my knowledge. I’d never met him, nor even knew that he existed. But the singular tragedy and consequence of his departure is not lost on me. This blog post will be automatically reproduced on my Facebook page, where some of Rajiv’s true blood relatives will see it. To them, I offer nothing but sympathy and shared rage. A lot of crime, while detestable, is sort of understandable. Child murder is certainly not in the “understandable” category. Rajiv was stabbed to death by two Black youths. This is relevant because the defining curse of all things Guyanese is the mindless and futile discontent between Indians and Blacks. It is one of the many reasons so many of use emigrated from the violence and poverty-plagued land of our birth. While Rajiv’s death may or may not have had a racial dimension to it, given the history of racial strife intrinsic to the legacy of all Guyanese, even those –like Rajiv– who were born abroad, it is necessarily an issue that comes to mind, awash in the grief of his violent end. Thus it behooves us to acknowledge the potential role of race as this case unfolds; to do otherwise serves no good purpose. So let us hope for four things: (1) that Rajiv’s murderers are brought to justice; (2) that we find out that race was not an issue in the event, lest we conclude that Guyana’s sins have migrated north; (3) that nothing like this ever happens again; and (4) that Rajiv’s parents are miraculously granted some degree of peace in the wake of such unimaginable tragedy.